Designed to meet the demands of competitive road riders, Bell's Gage Helmet is packed with comfort and safety-oriented features at a feathery 240 grams. The lightweight shell has been equipped with 26 oversized vents to provide channeled airflow during intense efforts, keeping you cool in the hottest riding conditions. This massive breathability comes with no sacrifice in strength thanks to the extra tough Fusion In-mold Microshell and lightweight internal reinforcement technology. On the inside, the Gage uses X-Static padding for cushioning, moisture transfer and odor resistance. Bell's proven TAG fit system ensures hassle-free adjustment with the turn of a dial. The Bell Gage is available in three sizes (see details below) and various colors. Claimed weight: 240 grams. Safety certified: CPSC; CE EN1078. Very comfortable while riding. Even better is it performs like a champ! Crashed at track nationals while going 25-30mph, literally broke my neck but no concussion. Helmet cracked and compacted exactly like it was supposed to and saved me a whole lot of problems. Can't recommend enough! Nice snug fit, as measured. Plenty of airflow. Certainly very light weight. I highly recommend this helmets, especially at the price. Bought two one for myself and one for the wife. I love this helmet, don't really feel it on my head once I start my rides. Plus it looks pretty stylish, which I can't say for other helmets I have tried. This helmet is very light and comftorable and has incredible air flow. Lightweight, comfortable and very nice looking. My old helmet was a nice Giro but it was needing to be replaced. I had a friend with one of these and liked the look and the incredible lightness. Since receiving the helmet, I have been nothing but happy with it. I got this helmet on 1 of the deal of the day specials, and at the reduced price it is a good deal. I got it to replace a Bell Sweep helmet that doesn't match the paint on my new bike. I expected the Gage to be an upgrade from the Sweep, and it is- but not at full price. Air flow seems the same for both, which is the biggest feature for me. The Gage is noticeably lighter, though, which is nice. And, of course, matching my bikes paint job pleases the vain side of me. So if weight is your 1 concern, the Gage is worth the $, at least at the reduced price. Fit/features/airflow are all pretty much the same as my old Sweep helmet, though. I have been a Bell Man since 1976 when I purchased their first cycling production unit - white lid wred V-shaped reflective tape. Since then I've owned many Bell helmets as I replace them on average every other year. I've raced, toured and commuted in Bells. The Gage is light wa nice low profile, however, the strap buckle slips . . . repeatedly and despite extra measures taken. Bell has used a lighter, silkier webbing which lacks ridges. As a result the buckle works its way down and the stub guide is of zero help. Am returning my unit as I really can't count on the buckle holding on major impact. Sorry Bell. This helmet is both comfortable and light weight. As others have stated, I've crashed wearing the Gage. High speed crash with a head plant onto a metal bridge. I do not now if I would have survived the impact without a helmet. The helmet performed as designed. It absorbed the impact and protected my face. I suffered no head or face injuries. The helmet cracked but stayed intact. I will buy the same helmet...without hesitation. This is also a good looking and well ventilated helmet. This is one of the lighter helmets out there...and biketiresdirect.com frequently has it on sale. It's a solid and very safe feeling helmet and the colors and style are right there with any top-level helmet. This is a good purchase to make! This is a very nice helmet. Was hesitant to drop this much money esp. when helmets can be had for [$] at department stores, but I really liked this one's looks and wanted an upgrade from my ill fitting old one. No regrets at all. It fits great, looks cool, and is so light you hardly notice it's there. This is my third Bell helmet (they fit my head better than Giro). Easy adjust, light, comfortable, nice colors-I like the matte finish of the 2013 Team BMC colors. No complaints. Comfortable lite weight, good looking helmet. I use this helmet for road cycling. I have been wearing Bell helmets for the last ten years. Pretty lightweight, comfortable (minus thin straps) and good ventilation. I've got a large head and the medium actually fits quite fine with plenty of room for a cap too. Use this as a commuter helmet, so I have Light & motions VIS lights mounted. Take the lights off and it mounts up pretty inconspicuously. Only drawback for me is that the straps are a bit thin and long. You'll want to tuck or cut the extra strap length otherwise it can flap. Going to a lighter helmet made a noticeable difference. I was having some issues in the shoulders and neck on longer rides ( 60). This Helmet is very comfortable too. This helmet was purchased as a second helmet. It's been suitable for that, but isn't my first choice. Giro Atmos is the go-to for me. Good helmet but could use better pading. 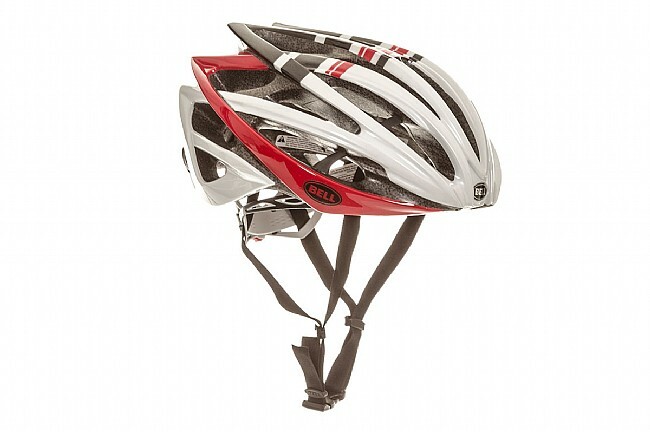 Sure this is not the lightest or even the most cutting edge helmet but something for 100 to 200 usd, it stands out. I used to look at helmets as best price or price/mass. It is hard to compare a 30usd helmet to something that is nearing 200 usd. When take wind into account then it becomes ever so complicated. The Gage, for a reasonable price, makes all the difference. Whether you are sprinting, descending or just fighting a super windy day, there is significantly less stress on your neck and shoulders (even from cross winds) while wearing the Gage. NOTE I found it slightly tricky to place glasses in the helmet. It was more like a two handed, long operation. My prior Bell hat was easy (flip glasses over and slide it in, just dont tilt your head down to Terra). BOTTOM LINE If you do not want to pay top dollar then consider this. It is not just the mass you drag along but how aerodynamic it is. This hat will do the trick. The Bell Gage helmet provides fuller coverage than my last helmet. The dial in fit is easy to adjust and accommodates wearing a light cycling cap or a heavier winter head wear. The construction seems solid though I hope I never have to test it in a real world situation.